Summer calls for hard partying, beach-body work-outs and sky-high heels. After a silly season full of mischievous antics, we all wish we could treat our feet to pampering pedicures, but for those DIY chicks Hotteeze for Feet will get you back on your feet. Litterally! Soothing and comforting, these heat pads will put the soul back into your sole; relieving tension, cramping and tightness. Hotteeze for Feet is part of a great range of products that relieve aches and pains, and provide steady warmth for your general comfort. With high-profile fans like Gemma Ward, our fairytale Princess Mary and director, Peter Jackson, who has them on-set for cast and crew, as well as being an in-flight luxury for passengers of United Arab Emirates, Hotteeze products are affordable creature comforts that will make you feel pampered and pain-free. Hotteeze is not another space-age invention. They are a traditional pain relief remedy, perfected in Japan over hundreds of years, in the form of disposable, self-adhesive heating pad. Hotteeze is an everyday item in Japan, and has now, finally, found their way to Australia. These heat pads are commonly used to ward off the cold and other ailment. For those suffering from aches and pains such as arthritis, poor circulation, pregnancy discomfort, muscle strain or menstrual pain, Hotteeze is just what the doctor ordered. 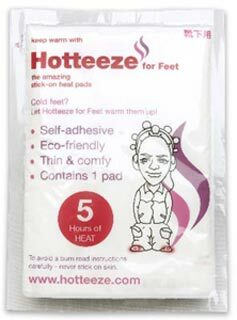 Also now available is Hotteeze for Feet, especially designed to keep your tootsies toasty all year round. Made form all natural and eco-friendly ingredients including iron, vermiculite and salt, Hotteeze is the best option for you and the environment. Once you open the packet, the solution inside the pad reacts with oxygen in the air to create heat - no wires attached. Once your Hotteeze has lost it's warmth, the contents can be emptied into the garden as a superior conditioner for your soil. The heat is constant and can last up to half a day, providing comforting warmth and sweet relief wherever, whenever and whatever!